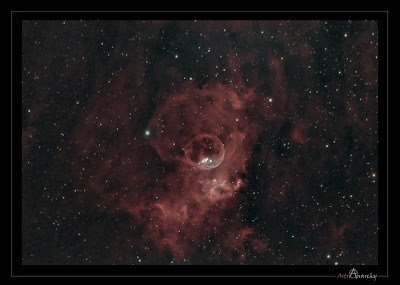 I relized yesterday, that I actually shot Narrowband colors for the Bubble Nebula! 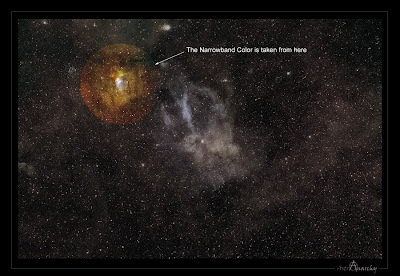 The colors are from a small part of the wide field image belowe. I marked it there. 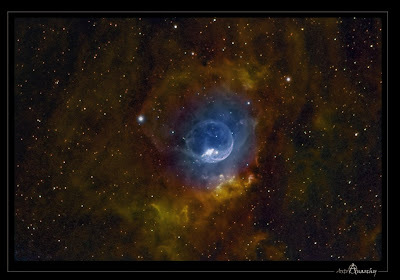 The original Bubble nebula, from 2007, is Shot with much higher focal lenght. It can be found HERE. It's amazing how litle and low resolution color information is enough to build HST-palette image. The signal from S-II and O-III channels is carefully mixed to a H-a channel. Then the O-III and S-II boosted H-a channel is used as a luminance. I must try this tecnique with some other, older , narrowband images as well!